OpenStack Mitaka, the 13th release from the OpenStack Foundation, came out in April. Brad Topol, an engineer at IBM and “core contributor” to the free, open source software, gave an overview of new features in Mitaka in a Cloud Standards Customer Council webinar Thursday. OpenStack “controls a large pool of compute, storage and networking resources throughout a data center,” Topol said. Everything is managed on a dashboard, eliminating the need to separately order up an application server and a database and configure networking to build a Web application, which could take more than half a year. It’s essentially an open source version of public cloud offerings such as Microsoft Azure and Amazon Web Services, so “no vendor lock-in” is a big part of the pitch. Beside its public cloud option, OpenStack is designed to allow organizations with the right resources build their own private clouds as well. Releases come out every six months, each building on the last with tweaks from a worldwide circle of OpenStack members and developers. 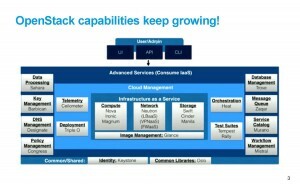 OpenStack Mitaka comes with “lots of growth, lots of intensity,” Topol said. 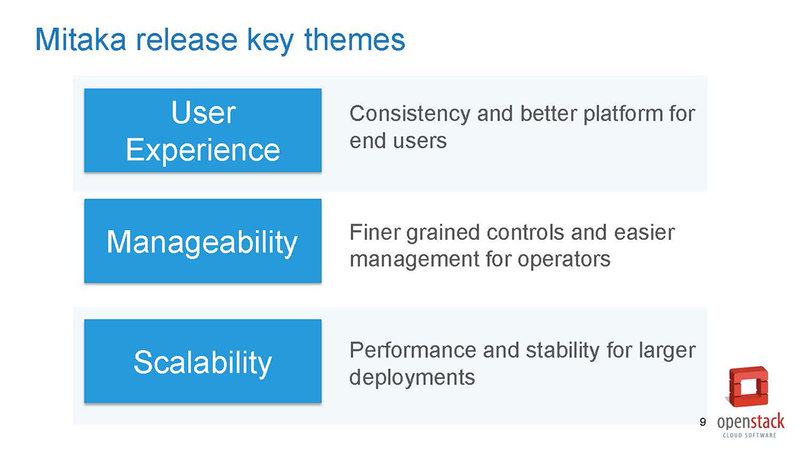 This slide, from a May 5 webinar sponsored by the Cloud Standards Customer Council on OpenStack Mitaka, displays the three characteristics designers were shooting for in the current release. The OpenStack Client is the centerpiece of the latest version. It’s a tool that lets users manage all of the operating system’s components — not just core computation, networking and storage but also “advanced services” such as data processing and workflow management. Subprojects — the term OpenStack uses for all its services — were difficult to manage, especially when the software first came out, back in 2010. “Each subproject had its own little command-line tool, which all worked slightly different, all used slightly different syntax, would drive our operators nuts,” Topol said. Services will also be easier to set up in this release, he said, including Nova, the computational engine, and Keystone, the identity management service. Neutron, OpenStack’s software-defined-networking function, lets users build a network, attach a server and assign an IP address — all in one step. 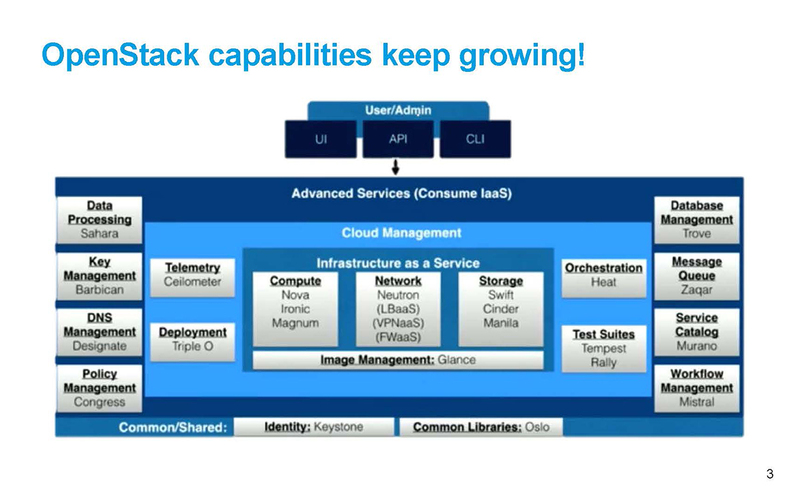 This slide, also from the May 5 webinar, displays components, called subprojects, in the OpenStack cloud platform. The release also aims to improve scalability, Topol said. 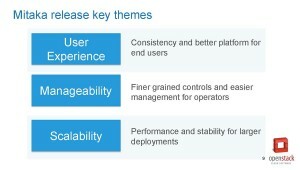 That means big, complex applications are easy to launch using the orchestration component, Heat. It’s also designed to quickly maintain and update resources apps need, such as database and Web servers, networks and attached storage. Jacked-up computational and security components also perform better in big applications in Mitaka, Topol said. The infusion of user-friendliness happens at a key time in OpenStack’s young life. The cloud operating system grew from a joint initiative by NASA and cloud computing company Rackspace into an open source project that has spanned the globe, with nearly 180 countries, 589 companies — Cisco, Dell and VMware among them — and tens of thousands of people contributing to its planning and design, Topol said. But people aren’t just adding to it; they’re also using it. European research lab CERN, for example, smashes particles together to learn about the universe and in the process generates reams and reams of data that’s then fed into OpenStack, Topol said. Retailers such as Walmart are using it for e-commerce — expanding on its elastic infrastructure in times of intense demand — say, Black Friday. And telecoms AT&T, Swisscom and South Korea’s SK Telecom have hooked up to OpenStack for its network function virtualization, which takes network services away from proprietary hardware and puts them on virtual machines. In a video, the OpenStack Foundation’s Chris Hoge said the new Mitaka release was influenced by the need for simplicity, consistency and transparency in interface design. Those same principles have put Apple at the top of the tech heap and catapulted apps like Box.com and Dropbox into the mainstream. Make it easy. What an idea. Find out where OpenStack release names come from.